For many, compliance with GHS guidelines is a reality and has been for some time. This was the case for a specialty chemical manufacturer in Ohio. However, their diverse product lines and recent acquisitions found them managing over 9,000 label formats. This diversity led to an inefficient labeling processes that was labor intense, error prone and wasteful. They found themselves asking . . . The result . . . a streamlined process which is saving the customer time and money! The SwiftColor SCL-8000P is a versatile wide-format 4-color printer. With label widths ranging from 1" to 9.25" and using durable pigment based inks, the SCL-8000P printer will support any chemical labeling needs. The Epson C831 inkjet printer is the go-to printer for large format GHS chemical labeling. The C831 offers flexibility when it comes to chemical and drum labeling requirements, printing durable labels and tags that can withstand the harshest environments. For high volume, 4" wide color printing, the Epson C7500 can't be beat. The C7500 is fast with print speeds up to 11.8 inches per second. Perfect for high- volume, on-demand color label printing. Media width: 2.0" - 4.25"
The Epson C3500 4-color printer offers versatility for printing on-demand color labels. A thermal transfer option for printing GHS labels is the cab XC4 and XC6 printers. Two in-line thermal transfer printheads, simultaneously prints 2-color labels in one pass. 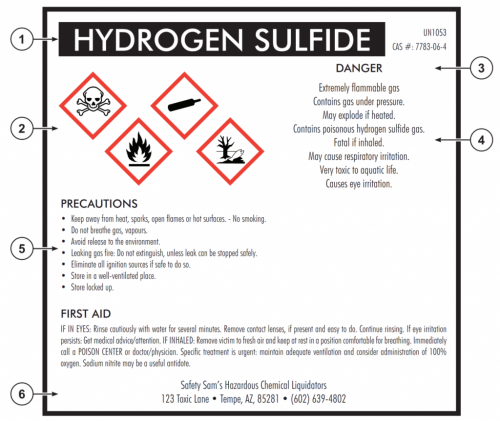 Print width: XC4 4.15" | XC6 6.4"
Signal Word - Descriptive word/statement that explains the potential hazard of the product. Examples "Danger" or "Warning"
Precautionary Statements - Statement that convey information on how to prevent or minimize the negative effects of coming in contact with the product. Precautionary statements fall into 4 categories: prevention, response, storage and disposal. Software is an important part of any GHS compliance solution and Bartender and Niceware label design software make it easy. Software versions from each include GHS label templates with drag and drop databases for pictograms, signal words, hazard statements etc. See for yourself! Download trail versions of either software software. Printers, labels, software . . . ADI has it all and can spec a solution that meets your specific business needs! Give us a call and let's start the discussion on your GHS label solution!